The cat (Felis Silvestris Catus) is a small mammal that makes for a great household companion and is well-known for its ability to hunt household pests. Also known as the domestic cat, this creature is currently the world’s most popular pet, their species being highly omnipresent in human population. This could be attributed to their close association with humans dating way back 9,500 years ago. The cat has been classified as an invasive species because of its very high adaptability and worrying on other animals. These problems are mostly caused by a huge number of feral cats all over the world. In the USA alone, these animals have a population of about 60 million. A group of cats is called a “clowder”, with a female cat being called a “molly” or “queen”, whilst a male cat is referred to as a “tom” (or a “gib”, if neutered). A breeding male is called a “sire” and a breeding female is a “dam”. A “purebred” cat is one whose ancestry contains only cats of the same exact breed and has a recorded history. A “pedigreed” cat is one whose history is recorded, but may contain ancestors of different breeds. Cats who do not have any recorded history or who stem from mixed ancestry are called “domestic longhair” or “domestic shorthair”. Sometimes these cats are also referred to as mongrels or moggies. The Felids (cat family) are a fast evolving group of mammals that share a common ancestor some 15 million years ago. This includes the cougars, tigers, lions and the domestic cat. The earliest conclusive evidence of domestication in cats is a kitten buried along with its owner in Cyprus, roughly 9,500 years ago. Domestication in cats was generally believed to have started in ancient Egypt, where it was considered to be a cult animal. It was also found in a study in 2007 that the line of descent of all domestic cats may have run through African Wildcats in the Near East, dating back to 8000 BC. Domestic cats belong to Felis, a genus which comprises a group of small cats with seven subspecies. Members of the genus Felis are the Jungle cat, African Wildcat, Arabian sand cat and the Chinese mountain cat. All these cats share the same ancestor that may have lived in Asia about six million years ago. Modern phylogenetics have made domestic cats a part of the Wildcat subspecies. The relationship of cats to humans is either commensal or mutualistic. Compared to dogs, however, cats have not gone through huge changes during its domestication. It is interesting to note, however, that there are a few characteristics of Wildcats that may have had a hand at helping the cats become more easily domesticated. Such characteristics include their high intelligence, small size, ability to display body language, and ease of tameness. The domestic cat’s behavior and form are somewhat similar to the wildcat and it can also perfectly survive in the wild as well. A number of natural characteristics and behaviors of wildcats may have prepared them for domestication. Among these traits are small frame, conspicuous body language, playfulness, the ability to be tamed, relatively sharp intelligence and social nature. Cats have the same anatomy and size as with other members of the Felid family. Their bodies are light and flexible with teeth that are designed to kill small prey. Cats have excellent hearing and eyesight, making them excellent predators. In fact, they can hunt more than a thousand species for food at night due to their excellent night vision. They can see at just one-sixth the required light level for human vision. However, domestic cats have poor color vision, in which the only colors they can distinguish are blue and green. Cats also have the inability to taste sugar; instead their taste buds are able to respond to bitter tastes and amino acids. Despite the cat’s excellent hearing ability, some species are more prone to deafness. Cats, despite being lone hunters, are a social species that use non-verbal communication and different vocalizations such as chirping, hissing, purring, growling, meowing and squeaking. Aside from being carnivorous in nature, cats can tolerate slightly high temperatures up to 126 F as long as there is availability of water. Their kidneys and digestive tract are designed to survive on a meat-only diet with little water. They can even drink seawater to rehydrate themselves. All cats have whiskers, otherwise known as movable vibrissae, on their face. 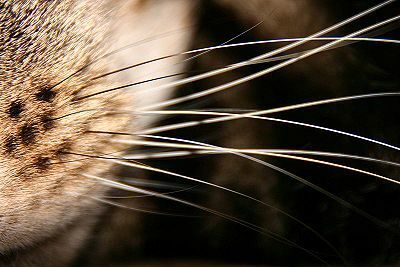 These whiskers not only help a cat determine the width of gaps, but also the location of objects in the dark, by feeling with their whiskers and sensing the currents of air surrounding the objects. Cats’ whiskers are also able to initiate blink reflexes, which helps to protect a cat’s eye from any damage.